Every time some new (or old) misogyny-related scandal shakes up the anglophone science fiction community, I stand on the sidelines, quietly watching the internets explode and wonder how this can be. Thing is, I probably live, day in, day out, in a far more misogynistic society than members of anglophone SF fandom do. And yet, my fandom is anything but freaked out by having women in it. This is a topic I will be coming back to, in depth. Now, I just want to share a video report of this year’s SFeraKon (the biggest Croatian con, which is, incidentally run mostly by women) by Nicholas Lloyd, who was Special Guest. The title of his video and the sentence at the end made me remember I have been thinking about posting on this topic for a long time. Btw, the title of the this video is true – geeks are the same the world over. And yet, it’s not entirely true: if it were, than women in anglophone SF fandom would be as many as they are in my home country, and as welcome. *It took me forever to choose a picture for this one. 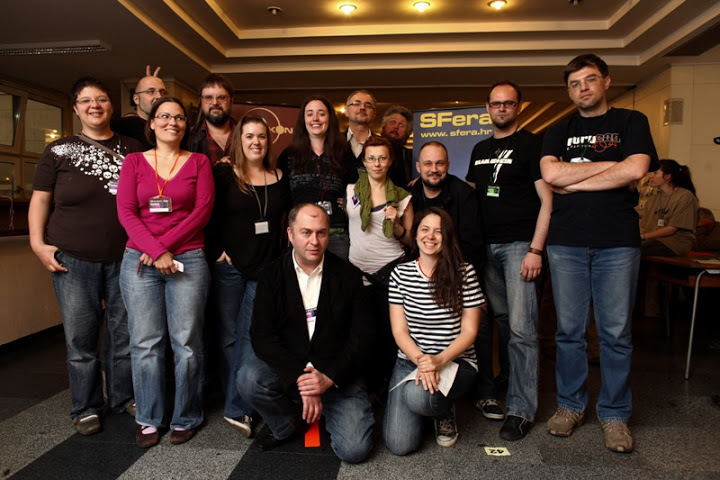 I went with the one of SFeraKon 2011 organisers and GoHs. There are plenty of pics of women only, but this one seemed most appropriate. Women may run things in Croatian fandom, but not to the exclusion of men. Only later did I notice that the three (male) guests of honour that year also happened to have been Serbian authors. That makes it a bit meta for me: tolerance all around.